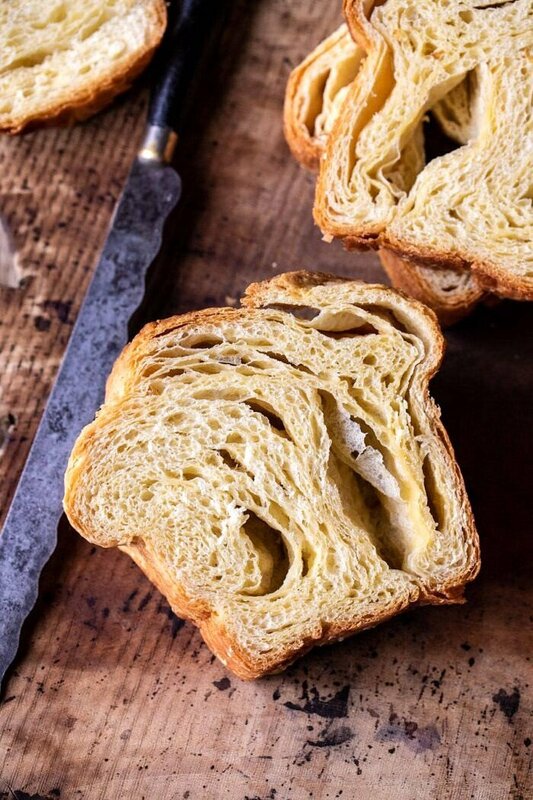 The BEST Flaky Honey Brioche Bread…for your weekend baking. 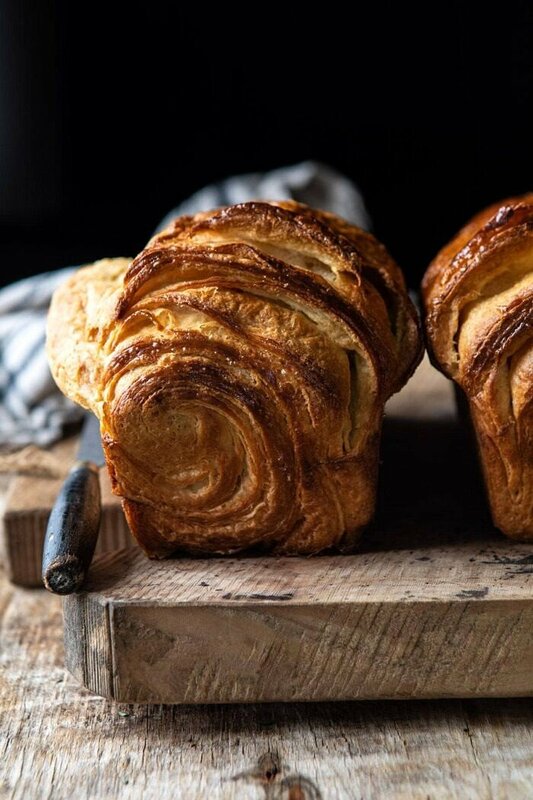 This light, buttery, super soft, and eggy brioche bread is swirled with hints of sweet honey, and makes for the most delicious, extra fancy companion to your morning coffee. This bread is great on its own, toasted with butter and topped with cinnamon sugar (so good). Or use it to make your favorite french toast – the options are endless. The perfect way to start your day! I don’t know why, but I almost never share recipes like this. For some reason I feel like I always need to share crazy different and unique recipes. I forget that really good “basics” are just as important! I made this brioche a few weekends back. Mostly because I really wanted a good bread to use in my favorite baked blackberry french toast. Up where we live in the mountains, good bread can be incredibly hard to come by. Most of the time I can find a good Challah bread, but the last few weeks the bread pickings have been slim. My guess is that all the snow over the past month has really set the stores back. For one, with the highway being closed on and off, trucks have had a hard time getting up here to make deliveries. Two, because of all the snow, the town has been packed to the brim with skiers. Leaving the grocery stores pretty much wiped clean daily. Long story short, I couldn’t find good bread, so I made my own Brioche! And I am now sharing it with you guys. Because, oh my gosh, it’s possibly one of the very BEST breads I’ve ever made. Yes, my homemade naan is amazing and will always be a favorite (always). But it’s a flatbread, so very different. And the beer bread in the cookbook? Totally still a favorite, but again it’s just very different, and nothing like a soft Brioche. This bread is a game changer. When I set out to make this, I was in no way planning to share the recipe. But as I was making the dough and swirling in the honey, it hit me that you guys might really enjoy the this recipe. I mean, everyone loves bread, right? And we all want to bake over the weekend, right? Plus, the light in my kitchen and the colors of this bread were just too pretty. I had to photograph it and I had to share. Because it’s just a dang good recipe and that is always most important! If you’re afraid of bread making, please do not be. It’s easy (and made easier if you have a stand mixer…hint, hint, invest if you love to bake). To sum it up, to the mixer you’ll add milk, yeast, honey, eggs, flour, salt, and butter…that’s the dough. Six very simple pantry staple ingredients that are really simple to throw together. Mix the dough, then allow about an hour for the dough to rise. Then it’s time to roll it out and layer with very cold butter (see photos!). 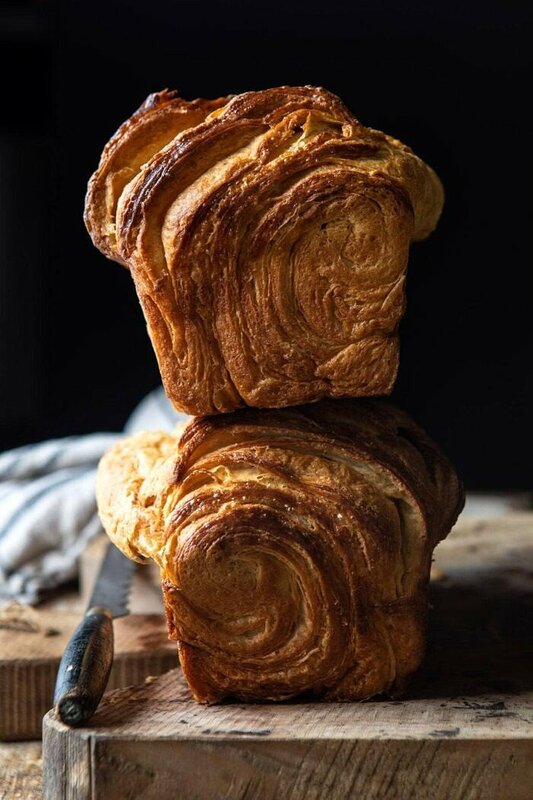 The layers of extra cold butter are what make this a “flaky” brioche, instead of a more traditional brioche. 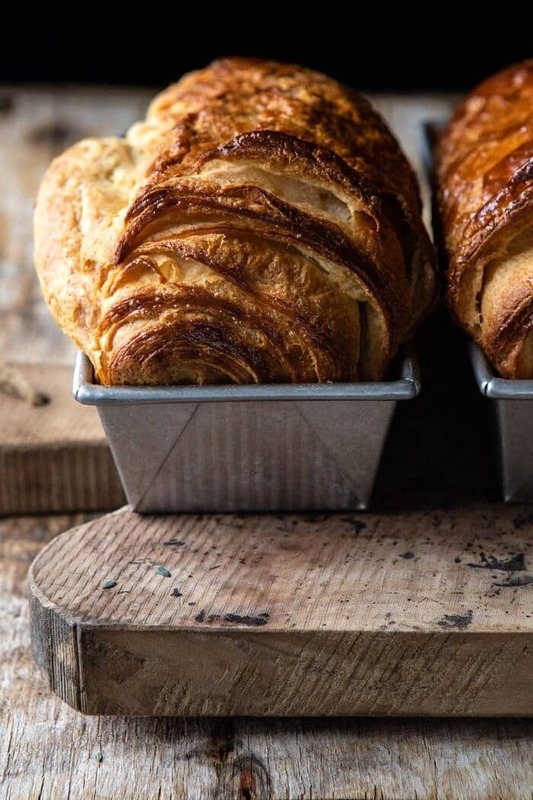 It’s kind of like a cross between brioche and a croissant, DELICIOUS. The key is to roll the dough out twice. I know it might seem like over-kill, but this will distribute the cold butter throughout the dough, creating buttery, flakiness with every single bite. Again, so DELICIOUS…and I promise it’s not hard or even that time consuming. My other trick? Quickly chilling the dough in the freezer! Saves so much time! After you roll the dough, divide it into two loaf pans, and let rise. Then brush the dough with a beaten egg to get an extra glossy top that looks beautiful after baking. As the dough bakes, the smell of freshly baked bread will waft throughout your house. Truly the perfect scent to welcome in the first weekend of spring. I highly recommend enjoying a slice or two warm, fresh out of the oven. Just add a little butter and honey. I also highly recommend serving this as morning toast, or for Sunday brunch. This is honestly the best when toasted with butter and spread with a sweet berry jam…or no, wait, with butter and cinnamon sugar. Yes, that’s my personal favorite (should I share my recipe for cinnamon toast???). Another great thing about this recipe? It makes two loaves!! You can freeze the second loaf, or do as I do, and bake up my favorite spring brunch recipe, blackberry ricotta french toast. It’s always a crowd favorite. You see? Endless options with this bread. Meaning, bake it soon, because it’s perfect for all your springtime brunching and snacking needs! Ohhh, and I just thought of this too…PB&J sandwiches? Maybe toasted? Yes, I have to do this. See, endless options. Enjoy! 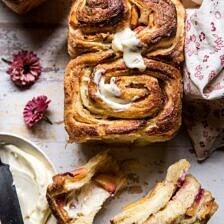 If you make this flaky honey brioche bread, be sure to leave a comment and/or give this recipe a rating! Above all, I love to hear from you guys and always do my best to respond to each and every comment. And of course, if you do make this recipe, don’t forget to also tag me on Instagram! Looking through the photos of recipes you all have made is my favorite! This light, buttery, super soft, and eggy brioche bread is swirled with hints of sweet honey. 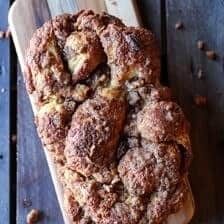 Great on its own, toasted with butter and topped with cinnamon sugar (so good), or use it to make your favorite french toast...the options are endless! 1. In the bowl of a stand mixer, combine the milk, yeast, honey, 4 eggs, flour, and salt. Using the dough hook, mix until the flour is completely incorporated, about 4-5 minutes. Add 4 tablespoons room temp butter and mix until combined, about 2-3 minutes more. 3. 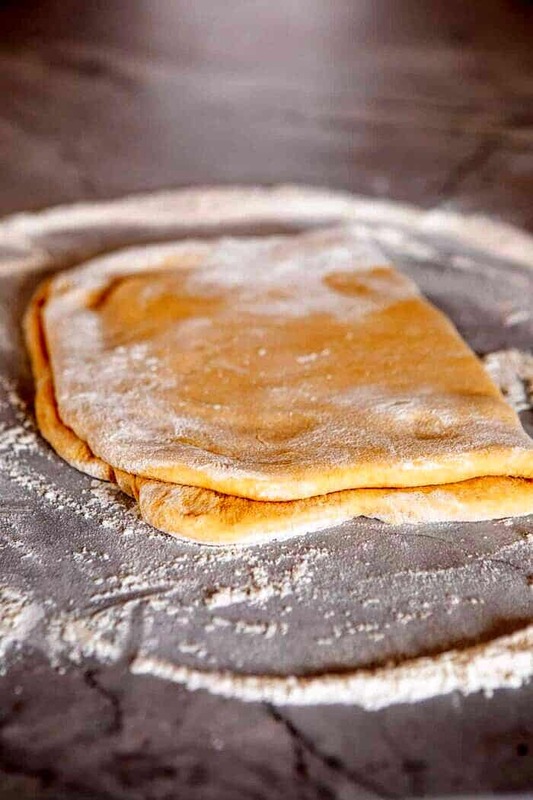 Punch the dough down and roll out onto a lightly floured surface, creating a large rectangle that’s about 12x18 inches. Lay the thin slices of cold butter on one half of the dough, pressing gently to adhere. 4. Fold the other half of the dough over butter, covering it completely. 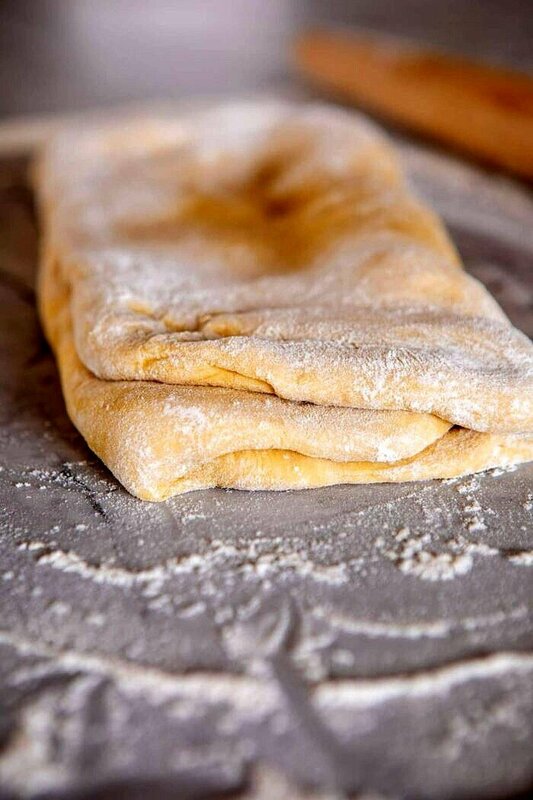 Roll the dough out into a large rectangle, roughly 12x18 inches. Fold 1/3 of the dough into the center, then fold the other 1/3 over the top of the first layer so you have three dough layers (like an envelope). Wrap the dough in plastic wrap and transfer to the freezer for 15-20 minutes until chilled. Alternately, you can chill the dough in the fridge for 1 hour or overnight. 5. Meanwhile, butter two (9x5 inch) bread pans. 6. Remove the dough from the freezer. Roll the (envelope shaped) dough into a rectangle (about 12x18 inches). 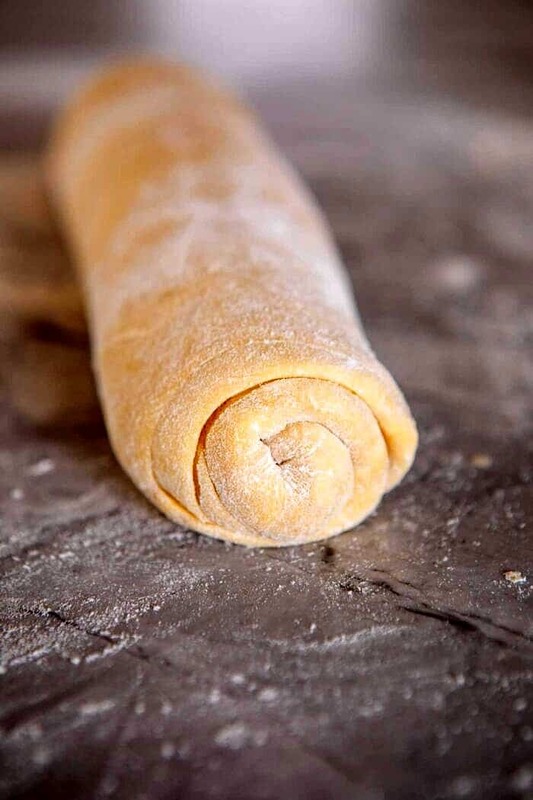 Starting with the edge of dough closest to you, roll the dough into a log, keeping it tight as you go. When you reach the edge, pinch along the edges to seal. 7. Cut the dough in half and place seam side down in prepared pans. Cover and let rise 45 minutes to 1 hour. 8. Preheat the oven to 350 degrees F. Place the bread pans on a rimmed baking sheet and brush with the beaten egg. Transfer to the oven and bake 30-35 minutes or until dark brown on top. Let cool in the pans for 5 minutes, then flip out onto a cooling rack. Slice and serve warm or cold. This looks so, so tasty! And I love it when people whose recipes I trust do basics, because I just *know* they’re going to work. All of the recipes I’ve tried from you have worked and so many of them have made it into my rotation, so it just adds so much confidence to recipes like this where there are hundreds out there that I *could* choose, that I’ve got the right one! I’m trying this one soon!! Steps 3-4 roll then freeze, steps 6 roll then place in pan, let rise. You state in description, goes through 3 rolls, I would assume a chill between each roll as is the custom, but only see 1 chill listed in instructions and 2 roll outs, is a step missing? In the directions no. 6 says pull the dough over the filling. What is the filling??? I don’t see anything about it. It does look yummy though. This looks amazing! We are total carb freaks and this bread fits the bill. However, we are counting calories, so I’m wondering/confirming that the 10 servings is per loaf, correct? These loaves are ABSOLUTELY gorgeous. 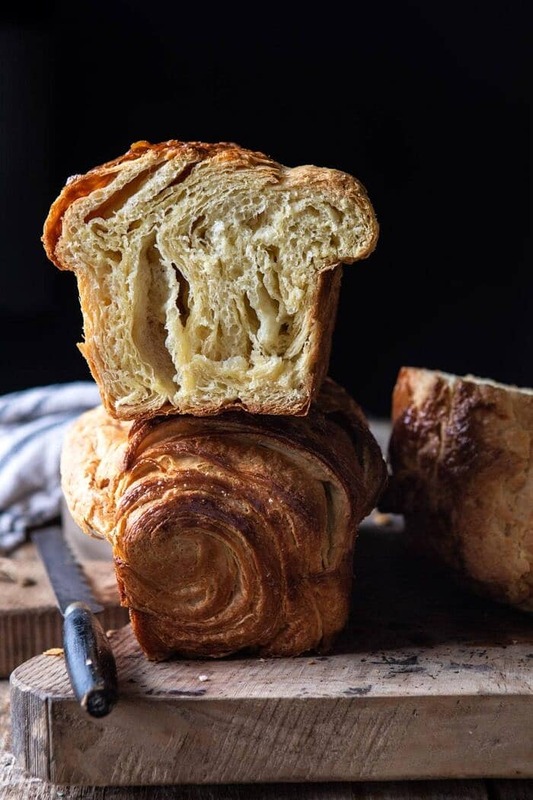 There’s nothing like a toasted piece of brioche bread and what I love even more is the recipe is somewhere between a brioche and a croissant. How fantastic! BTW, I am crazy about the boards you used to photograph this bread. Everything looks amazing. Thanks again for sharing your recipes. What if you dont have stand mixer? My resolution for 2019 was to learn to bake bread/work with yeast (I don’t know why it always terrified me). I’ve made a few different kinds so far so this recipe is going to be next on my list! This recipe sounds great, and I would love to make it, but you seem to skip any information about the “filling.” The recipe only talks about how to prepare the dough. So sad. could I substitute almond flour for white flour? or any gluten free flour? HI! Unfortunately, for this recipe I don’t recommend subbing a GF flour blend. I am just unsure of how the results will be and I worry it’s just too much GF flour for this type of bread. So sorry! This sounds so good! I really want to try it, but only have one loaf pan. Do you think it would work to chill one log in the refrigerator while the other one bakes? Thank you! I’m super confused about the rolling part (because you say in the narrative you roll it three times, but I only see two). AND, what is this filling you are talking about before the final rolling? 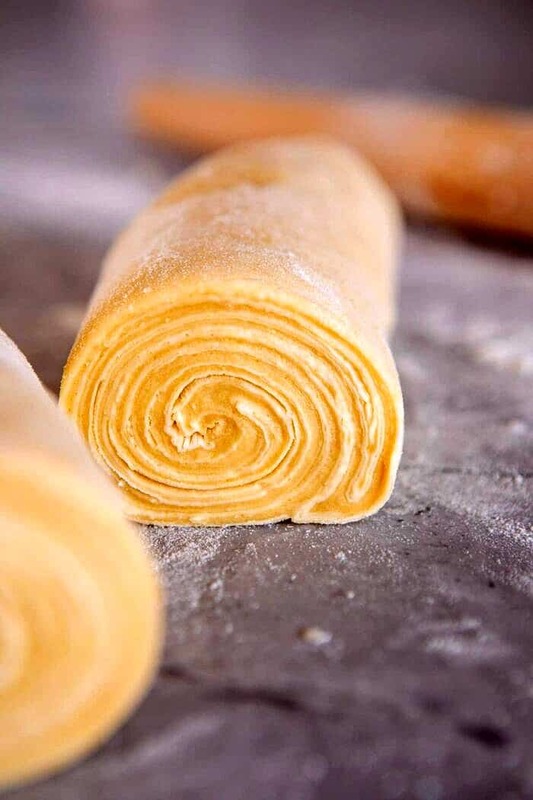 Do you do butter slices each time you roll it or just the first time? Can you do a quick video on the folding and rolling technique?? I have to try this! 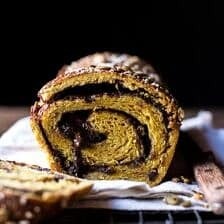 I would like to make the flaky honey brioche bread for easter. Can I freeze the dough then thaw and bake it or do I have to cook the dough first and freeze the baked loaf? I’m obsessed with this bread, it looks so flaky and gorgeous!!! This looks amazing, but I don’t see the filling listed in the recipe, even though it’s in the instructions! Can you help, please? This looks amazing! Like everything else you us! Please share a video or step by pictures of the rolling and folding process, that would be helpful. How would you adapt the baking time/temperature for higher altitudes? I moved from FL to NC and baking has become a challenge for me. I am making this right now! I only see rolling out two times and wondered if you add more butter between each roll, and if an additional roll was left out. I also do not see a filling as mentioned in the one step. Hopefully you can respond quickly as the dough is rising. Hi! 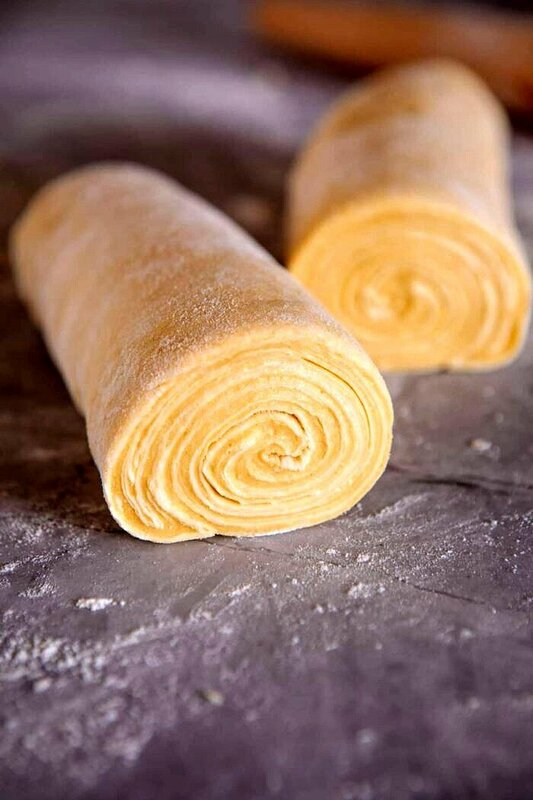 Yes, roll the dough out twice, but do not add more butter in between each roll. There is no filling, only butter. I am not sure where you see directions for a filling? Hope this helps and enjoy the bread! If you want people to have success in creating what you show in your photos and say in directions before the recipe contents, re-create it in your head as you are putting the pen to paper as we say in the field, as you are writing the instructions. Then read them again. Several steps are obviously missing here, no one will get the results you did following this recipe. You quickly answer positive comments but are slow when people comment in asking for corrections or clarifications. Thanks for these suggestions. There was one typo in the recipe and I fixed it the day the recipe went live. I am sorry if something was confusing to you, please let me know if I can help you in any way with this recipe. As for responding to questions, I do my best to respond in a timely manner and get to questions ASAP. It can be very difficult to keep up at times as I can’t be glued to my computer all day long. But again, I do my best. I answered most of these questions late Friday night, the same day the post went live. Hope this clears things up for you and again, let me know if you have a specific question. Thank you for reading, Tieghan. Hi Tieghan, you mentioned that you can freeze the second loaf for later use, at what point would you freeze it? After you cut the full log in half? Before or after it rises in the pan? Thanks so much! Can’t wait to try this! Tieghan, please never think that we don’t like basics. 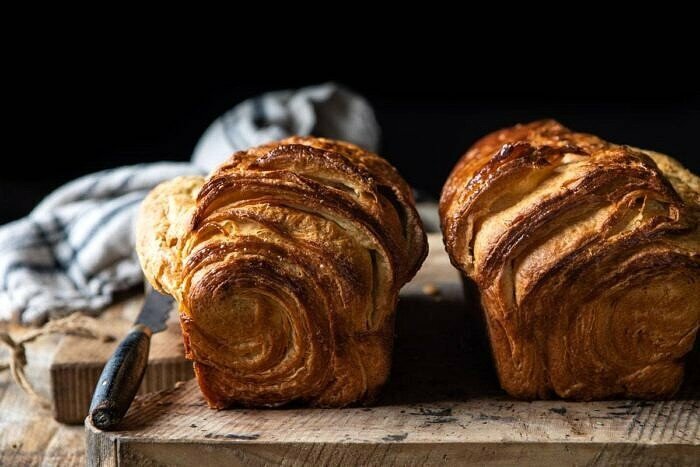 I personally don’t even believe this to be a basic recipe as this is a mix between a brioche and croissant, but please also share these recipes! Thanks for this amazing idea. 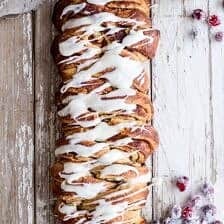 Need to make brioche asap! This is the best bread I’ve baked so far! Easy recipe and DELICIOUS. Toasted with nutella and jam = heavenly! Thank you! I will definitely be making this again. My dough is not rising?? What am I doing wrong? HI! Can you give me some more info on how you made the bread? Did you change anything about the recipe or do anything differently? Any info will help me problem solve. Hope this bread turned out for you! The loaves are beautiful! I’m wondering how well this bread keeps? 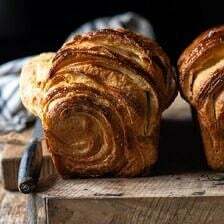 Does it stale fairly quickly like other brioche? Hi! If I am to freeze half of the dough, what temperature and time would you recommend for baking the frozen half? Would it need to thaw first or just go straight into the oven? I’m assuming I should freeze if after cutting the dough into two halves. Looking forward to this! Thanks! If you ever have extra time on your hands (I know, right?) it would be so incredible if you’d test some of your awesome breads and naan with a GF flour to include in the directions as an alternative. We love EVERYTHING we’ve made on your site so far and that’s the only area we haven’t delved into (breads). I’ve been drooling over your naan. I just tried this recipe and while it tastes great, it did not turn out like the recipe at all. Could you do a video tutorial and/or add pictures for every step? Mine looked nothing like yours by the time I rolled it at the end, it barely rised before the oven again. I was very confused during the rolling and folding. Did you mean fold it like a brochure? The word “envelope” was confusing and I wasn’t sure how small the cut the cold butter or how much space to leave between it. Could you also include a thickness when rolling the dough out? I rolled it to 12X18 but it was much thicker than yours. Any extra visuals would be much appreciated! It’s so disappointing that you thought, even for a moment, that this recipe wasn’t worth sharing! How glorious it looks! I can’t wait to try it. I hope I speak for all your readers when I say that much as we adore the crazy, different, interesting recipes, ones like this are most always welcome. Please keep sharing and don’t focus so much on always being “different”. Cheers and keep the awesomeness coming! I just made this recipe, and while the taste was fantastic, it was much more dense after baking. I didn’t have the flakiness or the air pockets. Any tricks or tips? I’m fairly new to bread-baking. This recipe is amazing! It will be great to have others like it! Thank you for sharing! Mine didn’t rise at all the second time or during baking, I was so sad! It tasted fine as just a dense white bread, but nothing like I was expecting. Any ideas why it would rise the first time, but not later on? Hey Amy, what variety of yeast are you using? Was there anything you changed about the recipe? Did the dough ever rise for you? Hope I can help! Would you recommend using a stand mixer with the standard whisk attachment (if one doesn’t have a dough hook)? Or is it better to use the wooden spoon and mix by hand? Thanks for your recipes and beautiful photos! This bread is absolutely amazing and without a doubt one of the most delicious loaves of bread we have ever made. Tomorrow we are going to try your French Toast recipe. I am glad there are two loaves! We used salted President butter. The whole house smelled like a French bakery. Thank you so much for sharing. We make so many of your recipes, it is always a pleasure to enjoy them. the brioche looks amazing, thank you for sharing. 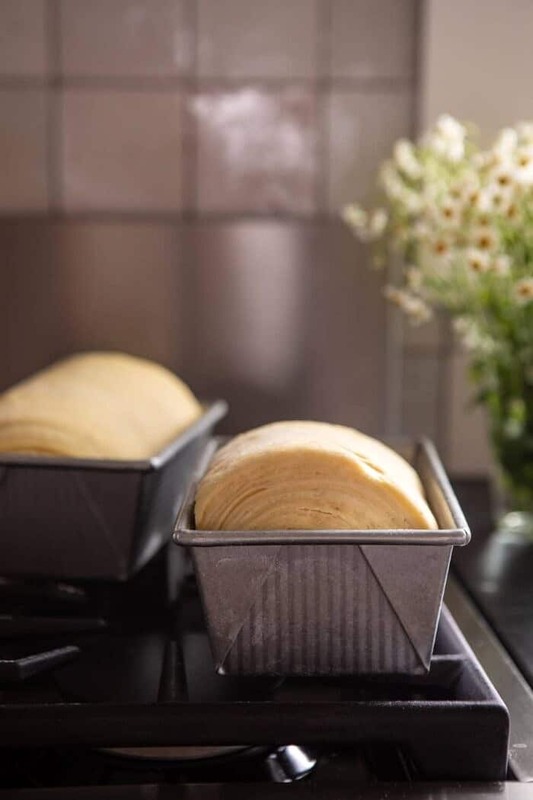 Have you ever tried the tangzhong method of baking with your brioche? Brioche has always been a little too challenging for me but when I found this Asian method the bread was so incredibly soft and springy. I was watching Bake off Australia when one of the contestants used this simple addition for their bread baking. This recipe was great! I made this and chose to freeze the second loaf. I want to bake the second loaf now. Do I just take it out of the freezer let it defrost and then how long do I let it rise for? As I have been baking the bread our family uses for years, I consider myself a fairy competent baker. My family’s favorite is croissants, but as those are a three day process to make, I was intrigued by this recipe. However, I was troubled with the instructions from the start. First of all, if you roll the dough as directed in the recipe, (a 12 X 18 rectangle) I can’t imagine how you could achieve the layers pictured in the post. But the idea of a flaky loaf like this in under two hours was appealing, so I decided to go ahead and give the bread a try. I prepared the recipe as presented and the result was the same as mentioned by other bakers: a dense white bread, not a cross between brioche and croissants. I would be delighted if you could provide an adapted recipe that would be more light and flaky. This recipe looks fabulous! I can’t wait to try. I wonder how a thin layer of cinnamon sugar would be with the butter? I’m a little confused. How much flour should be added for the dough? Is it 3.5 or 4 cups? And, high protein flour or low protein flour is preferable for this recipe? So good!! It was my first time making brioche and mine turned out really flaky. I needed almost 6C of flour to get the dough to form a ball. Also, I used a box grater to shred the frozen butter and did an extra chill/rolling to make sure I got enough layers. This is my third time making this wonderful Brioche bread. I just took them out of the oven and my kitchen/house smells heavenly. My husband loves the bread so I know we will be making it often. I did do one more turn and fold and I think it is actually better than just the two. Thanks so much for posting this. It is terrific. I’m frustrated. Three hours later and my dough still hasn’t risen to fill the bread pans. It’s moving extremely slowly; it is rising, but at a snail’s pace. I went to watch your Instagram video and realized: you put the yeast, honey and warm milk in and allowed those to activate the yeast. Your recipe here isn’t written out to do that, and so I didn’t do that step—I just mixed all the ingredients together, as that’s how it’s written here. Now I’m worried this is why my dough isn’t rising. It’s 10:30 and I want to go to bed and I still feel like I can’t put these “loaves” in the oven. I’m bummed. Hi Bridget, did you use instant yeast or active dry yeast? There is a big difference between the two. On my IG video I used active dry because it is all I had on had. Active dry yeast needs to be activated before using. BUT this recipe calls for instant yeast. What did you use? Hope all turned out ok! The times on the recipe information make no sense. 1 hour and 15 TOTAL time and yet in the step by step instructions there’s 3 hours of things to be doing including rising, baking, ect. 1) I accidentally bought dry active yeast instead of the instant yeast, would it be the same amount and how do you suggest working with dry active yeast for this recipe? 2) the recipe calls for warm milk. Is this just room temperature milk or do you suggest heating the milk up to a certain temperature?